LiftAid by EBP Medical 60 inch by 2 inch gait belt is designed to aid in transferring and walking fall-risk patients, while helping to prevent injuries caregivers are faced with performing this routine task. 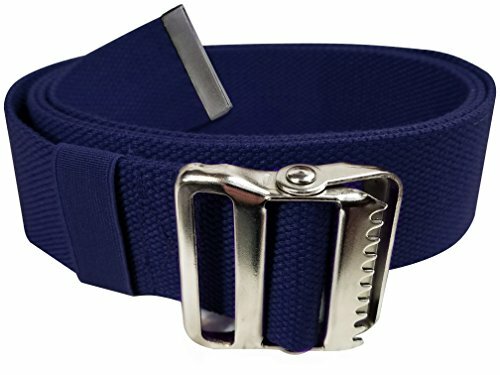 The belt is adjustable up to 60 inches and the belt has an elastic loop to hold the excess belt length. The gait belt should only be used as an aid for transferring or walking a patient. As a standard procedure with all equipment in any facility, please inspect the belt prior to every use. Only use the belt on a patient or resident when appropriate. If the patient or resident has had a recent surgery, please consult their physician for permission prior to using this belt on the patient. This belt should never be used as any type of restraining device on a patient. Never use the belt as a form of a seat belt either in a vehicle or in a chair. Superior Quality and Affordable Must-Have 60 inch x 2 inch gait belt designed to aid in transferring and walking fall-risk patients. Features an elastic loop to safely hold excess belt length. Transport patients safely with the high tensile strength metal buckle which has a weight capacity up to 300 lbs. The buckle provides a secure closure while at the same time allows the Nurse or Caregiver to quickly place and remove the belt from the patient. If you have any questions about this product by LiftAid, contact us by completing and submitting the form below. If you are looking for a specif part number, please include it with your message.